括起SQL* Loader模式中字段的字符。The character to enclose fields in SQL*Loader mode. "7369" "SMITH" "CLERK" "7902" "17-DEC-1980 AD 00:00:00" "800" "" "20"
"7521" "WARD" "SALESMAN" "7698" "22-FEB-1981 AD 00:00:00" "1250" "500" "30"
"7566" "JONES" "MANAGER" "7839" "02-APR-1981 AD 00:00:00" "2975" "" "20"
"7654" "MARTIN" "SALESMAN" "7698" "28-SEP-1981 AD 00:00:00" "1250" "1400" "30"
=> 将表示表列以及指定用户所拥有的（多个）数据文件的指向。will represent the table columns with there relative pointers to the datafile(s) owned by the specified user. 1. 更改 file#, block# 为单个dba？pro no calculations, contra more difficult to read? 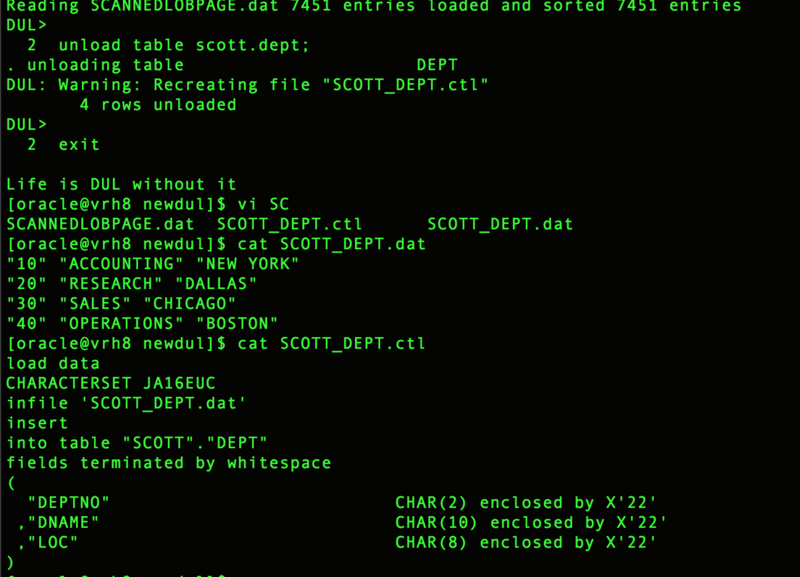 DUL is a standalone C program that directly retrieves rows from tables in data files. The Oracle RDBMS software is NOT used at all. DUL does dirty reads, it assumes that every transaction is committed. Nor does it check/require that media recovery has been done. DUL is intended to retrieve data that cannot be retrieved otherwise. It is NOT an alternative for EXP, SQL*Plus etc. It is meant to be a last resort, not for normal production usage. Before you use DUL you must be aware that the rdbms has many hidden features to force a bad database open. Undocumented init.ora parameters and events can be used to skip roll forward, to disable rollback, disable certain SMON actions, advance the database scn and more. The database can be corrupted, but an individual data block used must be 100% correct. During all unloading checks are made to make sure that blocks are not corrupted and belong to the correct segment. If during a scan a bad block is encountered, an error message is printed in the loader file and to standard output. Unloading will continue with the next row or block. DUL can and will only unload index/table/cluster data. It will NOT dump triggers, stored procedures nor create sql scripts for tables or views. (But the data dictionary tables describing them can be unloaded). The data will be unloaded in a format suitable for SQL*Loader or IMP. A matching control file for SQL*Loader is generated as well. DUL can unload indices and index organized tables. Index unload is usefull to determine how many rows a table should have or to identify the missing rows. Cross-platform unloading is supported. The database can be copied from a different operating system than the DUL-host. (Databases/systems done so far: Sequent/ptx, Vax Vms, Alpha Vms, MVS, HP9000/8xx, IBM AIX, SCO Unix, Alpha OSF/1, Intel Windows NT). The configuration parameters within “init.dul” will have to be modified to match those of the original platform and O/S rather than the platform from which the unload is being done. DUL will not dump, spin or hang no matter how badly corrupted the database is. Full support for all database constructs: row chaining, row migration, hash/index clusters, longs, raws, rowids, dates, numbers, multiple free list groups, segment high water mark, NULLS, trailing NULL columns, and unlimited extents, new block layout of Oracle8, partitioned tables. Later additions are lobs, compressed indexes, 9ir2 compressed tables. Varrays and ADTs (user defined objects) are partly supported in sql*loader mode. ASM is fully supported, files can be extracted from an asm disk group. No mounted ASM instance is used, the disks are accessed directly. Non default asm allocation unit sizes are supported. Data can be recovered from export dump files with the unexp command suite. Some initial work has been done for unpump to support data pump files. 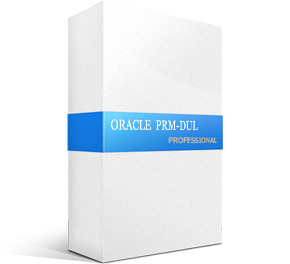 DUL should work with all versions starting oracle 6. DUL has been tested with versions from 6.0.26 up to 10.2. Even the old block header layout (pre 6.0.27.2) is supported. DUL itself is essentially a single byte application. The command parser does not understand multi byte characters, but it is possible to unload any multi byte database. For all possible caveats there is a work around. DUL can optionally convert to UTF8. This is for NCLOBS that are stored in UTF16. Multi Level Security Lables of trusted oracle are not supported. DUL can unload (long) raws. Nowadays there is suitable format in SQL*Loader to preserve all long raws. So Long raws and blobs can be unloaded in both modes. Nested tables are not yet supported, if they are needed let me know and it will be added. Varrays and ADTs are supported, also those that are stored as a kernel lob. 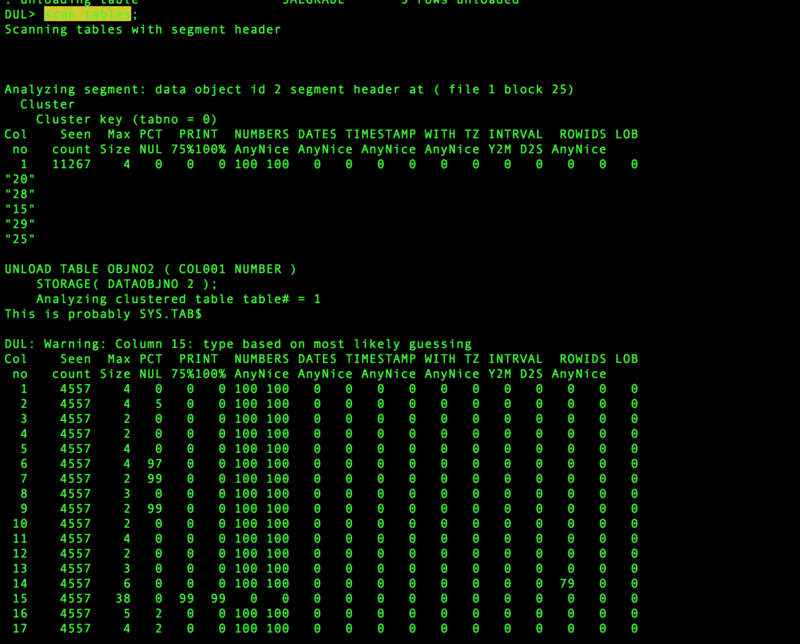 CLOBS, NCLOBS are supported both in SQL*Loader mode and in exp mode. BLOBS are best handled in exp mode, the generated hex format in SQL*Loader mode is not loaded correctly currently. There are two configuration files for DUL. “init.dul” contains all configuration parameters. (size of caches, details of header layout, oracle block size, output file format) In the control file, “control.dul”, the database data file names and the asm disks can be specified. The Oracle data dictionary is available if the data files which made up the SYSTEM TableSpace are available and useable. The number which Oracle assigned to these files and the name you have given them, which does not have to be the original name which Oracle knew, must be included in the “control.dul” file. You also need to eventually include the file numbers and names of any files from other TableSpaces for which you wish to eventually unload TABLES and their data. The lack of inclusion of these files will not affect the data dictionary unload step but it will affect later TABLE unloading. configure DUL for the target database. This means creating a correct init.dul and control.dul. The SYSTEM TableSpace’s data file numbers and names must be included within the control.dul file along with any data files for TableSpaces from which you wish to unload TABLEs and their data. For Oracle8 and higher the tablespace number and the relative file number must be specified for each datafile. Use the ” BOOTSTRAP; ” command to prepare for unloading. The bootstrap process will find a compatibility segment, find the bootstrap$ table unload The old ” dul dictv7.ddl”re no longer needed. This will unload the one table definition and the table’s data. This unloads all tables and data for the specified user. This unloads all of the database tables available. (except the user SYS). configure DUL for the target database. This means creating a correct init.dul and control.dul. (See Port specific parameters ). In this case control.dul file will need the numbers and names of datafiles from which TABLEs and data will be unloaded but it does not require the SYSTEM TableSpace’s information. Identify the lost tables from the output of step 3. To ease the hunt for the lost tables: the scanned statistical information in seen_tab.dat and seen_col.dat can be loaded into a fresh database. If you recreate the tables ( Hopefully the create table scripts are still available) then structure information of a “lost” table can be matched to the “seen” tables scanned information with two SQL*Plus scripts. (fill.sql and getlost.sql). Names are not really relevant for DUL, only for the person who must load the data. But the unloaded data does not have any value, if you do not know from which table it came. The guessed column types can be wrong. Even though the algorithm is conservative and decides UNKNOWN if not sure. Trailing NULL columns are not stored in the database. So if the last columns only contain NULL’s than the scanner will NOT find them. (During unload trailing NULL columns are handled correctly). When a table is dropped, the description is removed from the data dictionary only. The data blocks are not overwritten unless they are reused for a new segment. So the scanner software can see a table that has been dropped. Tables without rows will go unnoticed. Newer objects have a higher object id than older objects. If an table is recreated, or if there is a test and a production version of the same table the object id can be used to decide. Only complete good rows are written to the output file. For this each row is buffered. The size of the buffer can changed with the init.dul parameter BUFFER. There is no speed gained with a high BUFFER parameter, it should just be big enough to hold a complete row. Incomplete or bad rows are not written out. The FILE_SIZE_IN_MB init.dul parameter can be used to split the output (at a proper boundary) into multiple files, each file can be loaded individually. There are three different modes of output format. The generated file is completely different from a table mode export generated by EXP! The file is the minimal format that IMP can load. For each table a separate IMP loadable file will be generated. It is a single table dump file. It contains a header an insert table statement and the table data. Table grants, storage clauses, or triggers will not be included. An minimal create table statement is included (no storage clause just column names and types without precision). The character set indication in the file in the generated header is V6 style. It is set to mean ASCII based characterset. To enable export mode, set the init.dul parameter EXPORT_MODE to TRUE. As the generated pseudo dump file does not contain character set information set NLS_LANG to match that of the original database. In export mode no character set conversion is done. When loading the data you probably need to set NLS_LANG to match that of the original database to prevent unwanted character set conversion. For both SQL*Loader output formats the columns will be space separated and enclosed in double quotes. Any double quote in the data will be doubled. SQL*Loader recognizes this and will load only one. The character used to enclose the columns can be changed from double quote to any character you like with the init.dul parameter LDR_ENCLOSE_CHAR. Nothing special is done in stream mode, a newline is printed after each record. This is a compact format and can be used if the data does not contain newline characters. To enable stream mode set LDR_PHYS_REC_SIZE = 0 in init.dul. This mode is essential if the data can contain newlines. One logical record, one comlete row, can be composed of multiple physical records. The default is record length is 81, this fits nicely on the screen of a VT220. The physical record size can be specified with LDR_PHYS_REC_SIZE in init.dul. The file names generated are: owner name_table name.ext. The extension is “.dmp” for IMP loadable files. “.dat” and “.ctl” are used for the SQL*Loader datafile and the control file. To prevent variable substitution and other unwanted side effects, strange characters are stripped. (Only alpha numeric and ‘_’ are allowed). Column/Cluster Information: The number and type of the columns. For char or varchar columns the maximum length as well. The number of cluster columns and the table number in the cluster. This information can be supplied in the unload statement or it can be taken from the previously unloaded USER$, OBJ$, TAB$ and COL$. C-Structs in block headers are not copied directly, they are retrieved with specialized functions. 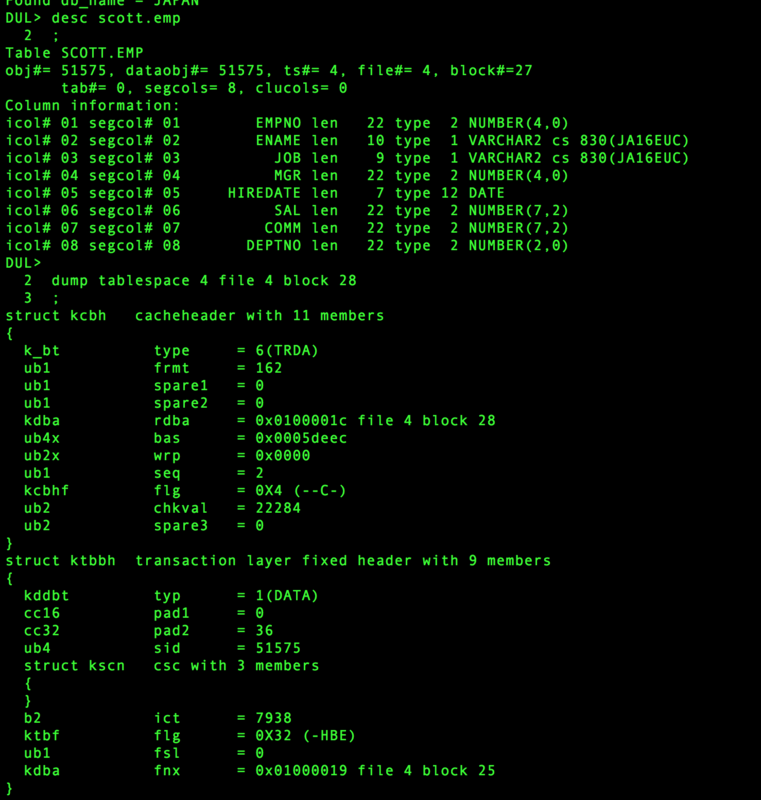 All offsets of structure members are programmed into DUL. This approach makes it possible to cross-unload. (Unload an MVS created data file on an HP) Apart from byte order only four layout types have been found so far. Vax VMS and Netware : No alignment padding between structure members. Korean Ticom Unix machines : 16 bit alignment of structure members. MS/DOS 16 bit alignment and 16 bit wordsize. Rest of the world (Including Alpha VMS) structure member alignment on member size. Order of bytes in a word (big/little endian). Number of bits for the low part of the FILE# in a DBA (Block Address). Alignment of members in a C-struct. Number of blocks or bytes before the oracle file header block. Size of a word used in the segment header structure. DUL can use the data dictionary of the database to be unloaded if the files for it exist and are uncorrupted. For the data dictionary to be used, internal tables must be unloaded first to external files: (USER$, OBJ$, TAB$ and COL$). The bootstrap command will find and unload the required tables. 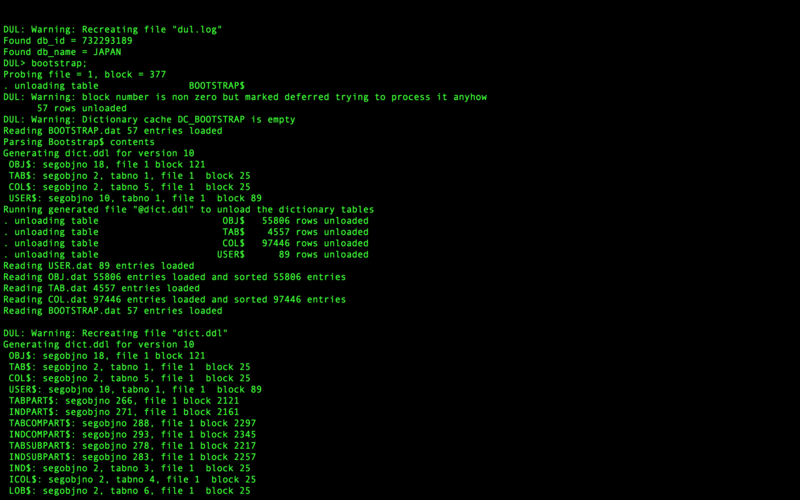 A block index contains address of valid oracle blocks found in a corrupt file system. Useful to merge multiple disk images or to unload from corrupted file systems. This is only useful in extreme file system corruption scenarios. The merge command uses the information in the index file to locate possible data blocks it looks for a combination of file numbers and object id, each candidate block is compared to the current block in the datafile. If the current block is bad, or has an older scn the candidate will will be written into the datafile. This is only useful in extreme file system corruption scenarios. REM  NOT allowed inside ddl statements. ( To avoid a two layer lexical scan). SEG.dat information of found segment headers (index/cluster/table): (object id, file number, and block number). create/insert statements and the offsets in the dump file. smaller. For partitioned objects use scan database. Uses SEG.dat and EXT.dat as input. matching extent with at least 1 table). All extents for which no corresponding segment header has been found. EXIT QUIT and EOF all cause DUL to terminate. UNLOAD TABLE requires an extent map. In 99.99% of the cases the extent map in the segment header is available. In the rare 0.01% that the segment header is lost an extent map can be build with the scan database command. The self build extent map will ONLY be used during an unload if the parameter USE_SCANNED_EXTENT_MAP is set to TRUE. All data blocks have some ID of the segment they belong to. But there is a fundamental difference between V6 and V7. Data blocks created by Oracle version 6 have the address of the segment header block. Data blocks created by Oracle7 have the segment object id in the header. The column definitions must be specified in the order the columns are stored in the segment, that is ordered by col$.segcol#. This is not necessarily the same order as the columns where specified in the create table statement. Cluster columns are moved to the front, longs to the end. Columns added to the table with alter table command, are always stored last. IGNORE: the column will be skipped as if it was not there at all. UNKNOWN: a heuristic guess will be made for each column. HEXRAW: column is HEX dumped. LOBINFO: show some information from LOB locators . BINARY NUMBER: Machine word as used in a LOB index. DUL uses the same bootstrap procedure as the rdbms. That is it uses the root dba from the system datafile header to locate the bootstrap$ table. Depending on the version this root dba is either the location of the compatibility segment containing the bootstrap$ address or for the newer versions the address of the bootstrap$ table itself. The bootstrap$ table is unloaded and its contents is parsed to find the first four tables (USER$, OBJ$, TAB$ and COL$). The other tables are unloaded based on information in these first four. How often the column is seen in a data block. The maximum internal column length. How often the column IS NULL. How often the column consists of at least 75% printable ascii. How often the column consists of 100% printable ascii. How often the column is a valid oracle number. How often the column is a valid date. How often the column is a possible valid rowid. These statistics are combined and a column type is suggested. Using this suggestion five rows are unloaded to show the result. These statistics are dumped to two files (seen_tab.dat and seen_col.dat). There are SQL*Loader and SQL*Plus scripts available to automate a part of the identification process. (Currently known as the getlost option). There is a describe command. It will show the dictionary information for the table, available in DUL’s dictionary cache. the parameter file “init.dul” is processed. the DUL control file (default “control.dul”) is scanned. Try to load dumps of the USER$, OBJ$, TAB$ and COL$ if available into DUL’s data dictionary cache. Try to load seg.dat and col.dat. Accept DDL-statements or run the DDL script specified as first arg. Strongly discouraged to use, will seldom produce more rows. Use only if you fully understand what it means and why you want it. skips the check for correct block trailer. The blocks failing this test are split of corrupt. But it saves you the trouble to patch some blocks. Strongly discouraged to use, will seldom produce more rows. Use only if you fully understand what it means and why you want it. Skips the check for correct block address. The blocks failing this test are probably corrupt. But it saves you the trouble to patch some blocks. If your dictionary is older than your datafiles then the data object id’s can differ for truncated tables. With this parameter set to true it will issue a warning but use the value from segment header. All other blocks are fully checked. This is for special cases only. row output buffer size used in both export and SQL*Loader mode. In each row is first stored in this buffer. Only complete rows without errors are written to the output file. Name of the DUL control file (default: “control.dul”). Sizes of dul dictionary caches. If one of these is too low the cache will be automatically resized. Maximum dump file size. Dump files are split into multiple parts. Each file has a complete header and can be loaded individually. Physical record size for the generated loader datafile. LDR_PHYS_REC_SIZE = 0 No fixed records, each record is terminated with a newline. LDR_PHYS_REC_SIZE > 2: Fixed record size. Maximum # of database files that are concurrently kept open at the OS level. Byte order in machine word. Big Endian is also known as MSB first. DUL sets the default according to the machine it is running on. For an explanation why this is called Big Endian, you should read Gullivers Travels. File Number Size in DBA in bits. Or to be more precise the size of the low order part of the file number. C Structure member alignment (0,16 or 32). The default of 32 is correct for most ports. Use \\xhh hex escape sequences in strings while parsing. If set to true then strange characters can be specified using escape sequences. This feature is also for specifying multi-byte characters. Use the scanned extent map in ext.dat when unloading a table. The normal algorithme uses the extent map in the segment header. This parameter is only useful if some segment headers are missing or incorrect. Set to FALSE to suppress the warning message if an existing file is overwritten. Normal use of DUL will only read the database files. However the UPDATE and the SCAN RAW DEVICE will write as well. The parameter is there to prevent accidental damage. Starting from rdbms version 10G osd parameters are easy to configure. Typically all parameters can be used at their defaults. The only one that might need attention is osd_big_endian_flag, when doing a cross platform unload, where the original database platform is different from the current machine. If osd_big_endian_flag is set incorrectly, it is detected at startup, when doing file header inspection. big endian or little endian (byte order in machine words): HP, SUN and mainframes are generally big endian: OSD_BIG_ENDIAN_FLAG = TRUE. DEC and Intel platforms are little endian: OSD_BIG_ENDIAN_FLAG = FALSE. The default is correct for the platform where DUL is running on. Number of blocks/bytes before the oracle file header. Unix datafiles have an extra leading block ( file size, block size magic number) A large number ( > 100) is seen as a byte offset, a small number is seen as a number of oracle blocks. Currently there are three types of specifications in the DUL control file. Each entry on a separate line. The asm disks must precede the asm files. A block index is a way to access oracle blocks on corrupt file systems. In general a corrupt file system is not wiped out, its not empty. Due to the specific layout of oracle blocks it is possible to datablocks an store their location in the block index. See also the create block index command . A block_index_name is a normal identifier, it is used to construct an unique file name. Each entry can contain a part of a datafile. The smallest unit is a single data block. This way it is possible to split datafiles that are too big for DUL in parts where each part is smaller than 2GB. In general it is sufficient to specify the file name. Even for a single block. If compatible is 10 or higher the file numbers and the tablespace numbers will be read from the file header. If the specified details are different from the file header DUL will give a warning but use your specification. This is to be able to unload files with a corrupted header block. For debugging it is possible to dump the file header. This can generate output similar to below. Normally this should not happen since you should create a demo database and check this via the DUL documented (in html page) query. The mismatch in DBA’s is only in the file number (first number in brackets) part. The second number, the block number, is correct. The following output was generated when the db_block_size was set too small. The correct value was 4096 and it was set to 2048. Normally, the value for this parameter should be taken from the Oracle instances’s init.ora file and will not be correctly set. If you get the following error it is caused by the data dictionary tables “USER$, OBJ$, TAB$ and COL$” not being correctly generated. To fix this error simply delete all dictv6.ddl or dictv7.ddl created .dat and .ctl files and restart. If you do not know anything about the structure of a EXP dump file this can be difficult. Here is a quick explanation. Apart from the file header a dump file has MARKERS that identify the various sections. In each table section there will be SQL statements. The most interrsesting part is the create table statement, followed by the insert into table statement. The insert statement is directly followed by the bind information, (number of columns, and for each column its type and bind length and a small bit more). Then it is followed by the actual columns. Each column is preceded by a two byte length, followed by the actual column data. There are several tricks for longer columns possible. The end of the column data is marked by the special length marker OXFFFF. There is no marker for the beginning of a row. Resynching after a corruption is trial and error. Corruption are generally not immediate detectable. The format is slightly different for DIRECT export, so you will have to use the DIRECT option for DIRECT exports. The offset to be specified is the beginning of a row. In general the first one directly behind the bind array, but for optimal flexibility you can start anywhere in the row data. The first step is to scan the dump file to find the offsets and the sql statements. Each output line starts with the offset where the item is found. Now build an unexp statement from the create table statement and the direct/conventional information and the start of the column data. This builds the normal SQL*Loader file and a matching control file. In the output file one extra column is added, this is related to the status of the row. A P means the row is Partial, (some columns missing) R means Resynch, it is the first row after a resynchronisation. O means Overlap, the previous row had errors, but the new row partly overlaps the other one. 3. How to rebuild object definitions that are stored in the data dictionary ? 4. How to unload data when the segment header block is corrupted ? 5. How to unload data when the file header block is corrupted ? 6. How to unload data without the system tablespace ? 7. Appendix A : Where to find the executables ? explanation of Bernard’s Data UnLoader capabilities. the next row or block. that object numbers are fixed for these tables due to the rigid nature of sql. is not present see chapter 6. REM Can/must be specified when data is needed into export/import format. REM with only a create table structure statement and the table data. REM Grants, storage clauses, triggers are not included into this dump file ! REM will be something like dump001.ext, dump002.ext, etc in this case. REM smaller than 1GB ! COL$ tables according to the database version. => this will unload all the tables owned by that particullarly user. datafile(s) owned by the specified user. => Scans all blocks of all data files. (object id, file number, and block number). 2: ext.dat information of contiguous table/cluster data blocks. => Uses seg.dat and ext.dat as input. could corrupt the healthy database as well. 3) Grant connect, resource, imp_full_database to the new user. WebIv to generate such PL/SQL creation scripts. be able to recreate the bitmap indexes succesful ! the database is necessary to unload the data from the datafiles. 1) Create an appropiate “init.dul” (see 2.1) and “control.dul” (see 2.2) file. this situation like patching the datafile header block. overwhelming task and a good knowledge of the RDBMS internals are needed here. First of all you need a good knowledge of your application and it’s tables. Column types can be guessed by DUL, but table and column names will be lost. interpreter will be terminated as well. the datatype as it was before. We installed 11gR2 GI software and applied PSU2 patches upon getting runupgrade.sh prompt.runupgrade.sh hang on the first node. [root@vrh8 tmp]# df -lh . We installed 11gR2 GI software and applied PSU2 patches upon getting runupgrade.sh prompt. Grid Infrastructure on Linux/Unix [ID 969254.1]” 1A section, it didn’t help. ACFS-9323: Creating module dependencies – this may take some time. INT at /d22/oracrs/11.2.0.2/crs/install/crsconfig_lib.pm line 1173. Oracle root script execution aborted! 1. The below logs are required to analyze this issue. Please upload the logs under the above directories. Zip and upload the files including the subdirectories. 2. When the rootupgrade was handing, did you check the usage of /tmp. Was free space exhausting? 2011-02-13 13:07:55: Upgrading the existing voting disks! 2011-02-13 13:07:55: Executing cmd: /d22/oracrs/11.2.0.2/bin/cssvfupgd <<<<<<<<<<<<<<< The root script seems to hang at this point. Oracle Database 11g Clusterware Release 11.2.0.2.0 – Production Copyright 1996, 2010 Oracle. All rights reserved. 2011-02-13 14:19:31.132: [ SKGFD]WARNING:io_getevents timed out 2226 sec >>>>>>>>>>>>>>>>>>>> After about one hour it shows time out error. The script has stalled at the voting disk upgrade phase. Please provide me the below details. 1. What cluster file system are you using for the voting files? provide its details and the mount options used. 4. Get the diagwait detail. owc may not be required now as the issue we face is clear. Make sure you are running ‘crsctl get css diagwait’ from the old crs home. You can also check it in multiple node. If it errors out, this has to be fixed as explained in the above note. in Your update about cssvfupgd.log You stated it was hanging there. 2011-02-17 0:48:19.372: [ SKGFD]WARNING:io_getevents timed out 4294 sec <<<< present ??? Oracle Universal Installer for Oracle Clusterware 11g release 2 (11.2), does not support the use of raw or block devices. However, if you upgrade from a previous Oracle Clusterware release, then you can continue to use raw or block devices. @ Enterprise kernel (redhat compatible) for installation. As per last action plan (conveyed if any) you need to contact REDHAT support to know the cause of this issue. Workaround is to not use OCFS and go for raw device for upgrade to succeed. The solution provided by Oracle bug developer is to use OEL and not RHEL or contact RHEL support for identifying the cause and solution (incase they have already tested this setup). Let me know if RHEL support is already engaged and provide the case id so that I can open internal SR for Oracle/Red Hat Joint Escalation Team (JET) Engagement for both vendors to work together internally. – verified post upgrade checks and logs to confirm GI upgrade was success ! Bigfile Tablespaces Number of blocks A bigfile tablespace contains only one datafile or tempfile, which can contain up to approximately 4 billion ( 232 ) blocks. The maximum size of the single datafile or tempfile is 128 terabytes (TB) for a tablespace with 32 K blocks and 32 TB for a tablespace with 8 K blocks. Smallfile (traditional) Tablespaces Number of blocks A smallfile tablespace is a traditional Oracle tablespace, which can contain 1022 datafiles or tempfiles, each of which can contain up to approximately 4 million (222) blocks. External Tables file Maximum size Dependent on the operating system.An external table can be composed of multiple files. Service "YOUYUS" has 1 instance(s). Service "YOUYUS_XPT" has 1 instance(s). Service "cXDB" has 1 instance(s).